NOTE: This was my most successful cartoon to date. On the first day it had 500,000 views on FB alone. It's now approaching 1 million. GrrrGraphics also reached the 61k mark on Twitter. I guess it's a matter of time when Google, FB and Twitter will shut me down, lol. 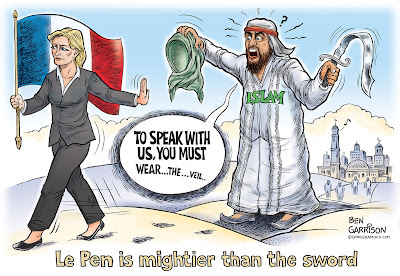 Kudos to France’s Marine Le Pen. She refused to don the veil—a headscarf—as a requirement to meet with a Muslim religious authority. I decided to draw a quick cartoon to commemorate her act, because all other female political figures usually submit. Such a clash of cultures results almost always results in the west caving into Islam. Even Hillary Clinton wore the veil several Times during her mideast trips. 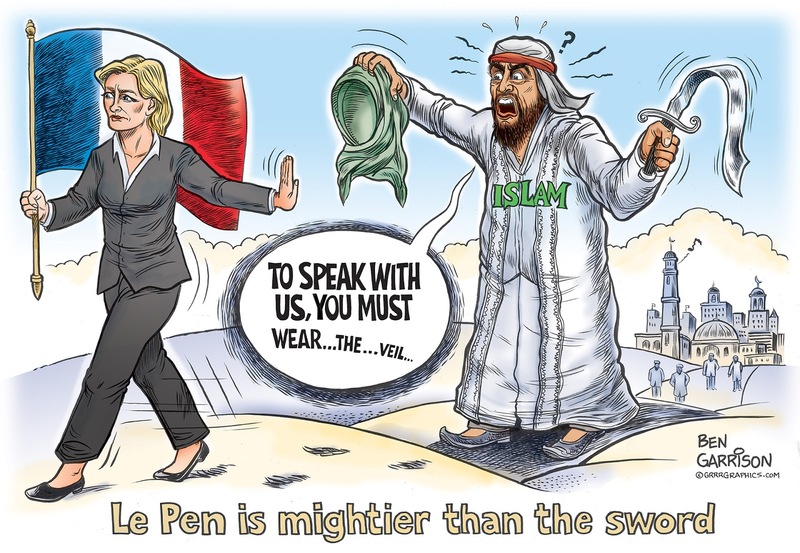 So much for her standing up for western values and freedom for women, who in some Muslim countries can be whipped if they go out in public without covering their heads. Of course, we know Hillary received millions of dollars from Saudi Arabia. That’s probably why she doesn’t criticize the House of Saud’s brutality toward women.